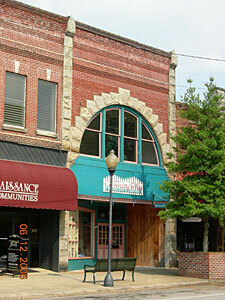 Pressed brick two-story commercial structure divided into two distinct sections. Three rough-faced stone piers with corbeled and pointed caps at corners and between building sections. Narrow stone string courses. Keystones in flat lintels above windows in southernmost storefront. A stone arch in northern storefront projects up into the second story. Storefronts modernized. Commercial Bank Building ca. 1905 Commercial Bank, the town's second, occupied the northern protion of the building until merging with First National Bank. The Wanteska Trust & Banking Company operated here from 1909 to 1919. Other tenants hae been La Vogue Hat Shop, Patterson's Women's Wear and in the southern storfront W.H.Hawkins & Sons, Jewelry/Optometrist and Pattersons's Men's Shop.